If you think pictures are worth a thousand words, you’ll be a fan of the new Jasper web cam and Banff web cam over at Rockies.com. The crazy thing about these cameras is that you actually control them from your computer. At first I thought the guys in the office were messing with me, like the time they let me go around saying the word “tech” pronouncing the “ch” like you’d do in crunch. But no, these cameras really are controlled by your computer. Just click the button in the lower right hand corner and then use the sliders on the side to move the camera up and down, left and right, and to zoom. You can also take snapshots with it, and you don’t have to be a techie to figure it all out. 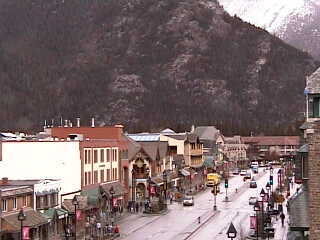 Snapshot from the Banff web cam. Now, as a Mountain Man, I can see where this camera would be useful for me. For instance, if my Mountain Woman were looking for me, she might hop on the Banff or the Jasper cam, and take a look in the surrounding national park land to see if I was on my way down the from the mountains yet. Or she might just camp it on the front door of my favorite Jasper or Banff bar and wait for me to come out. This could save me a lot of explaining, and quarters that I’d be pumping into a payphone to let her know when I got back in town. As for someone who’s thinking about a Banff or a Jasper vacation, this would be a great way to check on the weather, local activities, or to see the night life in town. I could also imagine people dialing up their friends while they’re on vacation, telling them which cam to go to, and waving hello from downtown Banff or Jasper. Trying to convince someone to go on a Jasper or Banff vacation? Just focus right in on the town with one of our webcams, and you’ll bowl them over with this area’s amazing beauty.